The Peter de Keizer lab at Erasmus University Rotterdam has unveiled a D-retro-inverso (DRI) peptide mimetic of the p53-FoxO4 interface that selectively kills senescent cells (TASC, targeted ablation of senescent cells, “senolytic”). This strategy rejuvenated aging hallmarks in naturally aged and accelerated aging (DNA damage mutant) mice. In addition, the peptide cleared senescent cells resulting from chemotherapy treatment. The Judith Campisi lab at the Buck Institute, where senior author Peter de Keizer was a postdoc, has long studied the role of senescence in the tragic accelerated aging post-chemotherapy. 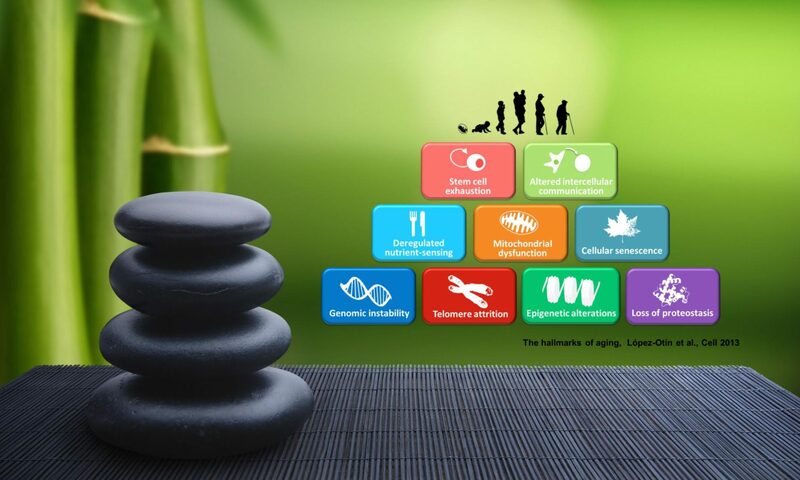 Many chemo drugs are DNA-damage inducing agents, or are otherwise cytotoxic, and result in accumulated senescent cells that secrete the pro-aging, pro-inflammatory Senescence Associated Secretory Phenotype (SASP, see this Annual Reviews article). De Keizer worked on the FoxO4 peptide in the Campisi lab, but it did not work properly. Later, the D-retro inverso modification was found to be critical for molecular stability and efficacy. Last year, Unity Biotechnology raised a $116M series B financing to pursue senolytics for osteoarthritis and other age-related conditions. Spun out of the Buck Institute and Mayo Clinic, their focus has been on small molecules developed by Abbot/AbbVie, such as ABT-263, a selective inhibitor of BCL-2 family proteins (primarily BCL-xL and BCL-2). This drug has undergone clinical trials in oncology, but dose-limiting thrombocytopenia occurred (thrombocytes are highly dependent upon BCL-xL for survival). This year it became clear that Unity will repurpose ABT-263 or its analogs for local administration into the intra-articular space of the joints afflicted by arthritis, thereby avoiding off-target effects. Rumor has it that the FoxO4-DRI peptide will be translated into a biotech development effort in the near future. This company is unlikely to pursue osteoarthritis as an indication. Pending further confirmation, as long as the FoxO4-DRI peptide lacks the side effects of ABT-263, it could be much more promising than Unity’s lead candidate. The possibility of systemic administration opens the door to cardiovascular and oncology indications in particular, where senescence and the SASP have been shown to play a critical role in pathogenesis. de Keizer et al. 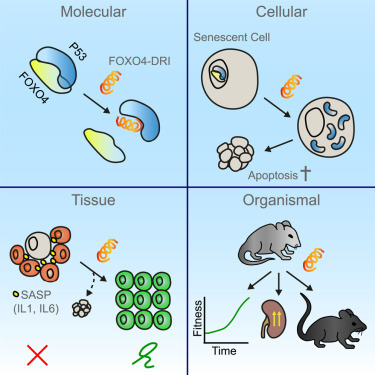 Targeted Apoptosis of Senescent Cells Restores Tissue Homeostasis in Response to Chemotoxicity and Aging. Cell 2017. Elisseeff, Campisi, Unity, et al. Local clearance of senescent cells attenuates the development of post-traumatic osteoarthritis and creates a pro-regenerative environment. Nature Medicine 2017. Monoclonal antibodies work well for extracellular or cell surface-bound target antigens. Inside the membrane, though, small molecules with favorable pharmacological properties (e.g., Lipinski’s Rule of 5) are preferred. Coupled with new, well-named methods like AdPROM (Affinity-directed Protein Missiles) that mediate the “orderly” proteasomal degradation of targets, we may be opening a new chapter in pharmacology. Also see: Phys.com, “Researchers report on cell-permeable nanobodies” 2017. Some tissues heal better than others after surgery. Connective tissue like tendons and ligaments don’t heal well, but they are injured quite frequently. Cytokines and growth factors like PDGF, VEGF, TGF-beta, and bFGF are able to improve healing outcomes. The problem is releasing them close to the site of injury and over a long period of time. You don’t want them in circulation because they might cause cancer. Coating surgical sutures is an obvious solution. However, the surface area is limited (you can’t actually load many molecules onto them), the molecules rub off during implantation, and the growth factors are released quickly after use (e.g., 100 hours). A group at Georgia Tech led by Younan Xia and first author Jianhua Li developed medical sutures that are porous. This paper was published in 2016, so I am looking forward to results in vivo. Li, J. et al. (2016) Surgical Sutures with Porous Sheaths for the Sustained Release of Growth Factors. Advanced Materials. 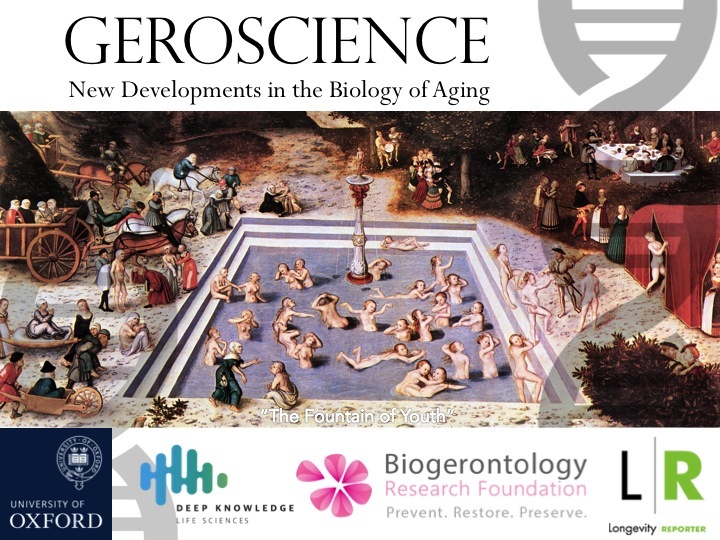 This article lists recent entrants into the anti-aging biotechnology sector (including Google and J. Craig Venter); the SENS Research Foundation framework for combating aging as described by Aubrey de Grey, PhD; and recent advances in molecular biology aimed at attenuating the underlying molecular mechanisms of aging. According to UN data, global population growth peaked in the 1970’s at 2.1%. As the poor lift themselves out of poverty, they have fewer children (quality over quantity). Today, the global population growth rate is about 1%, which is less than the required 2.1% replacement rate to keep a steady state. Eventually, the global population will peak at 11 billion around 2100 and then level off. h/t Avi Roy and the OurWorldInData.org team at Oxford. Even if population were not declining, would it be morally right to abstain from developing more effective medicine (and thereby prolonging average lifespan — healthy or not)? Obviously we must do everything in our power to improve quality of life (and as a side-effect, length) for those who are already alive. From my original post “Malthus Revisited: Statists Seeding Fear Again” at C4SS. Caption: Some fearmongering from the 1970’s Club of Rome which first promulgated the overpopulation myth. 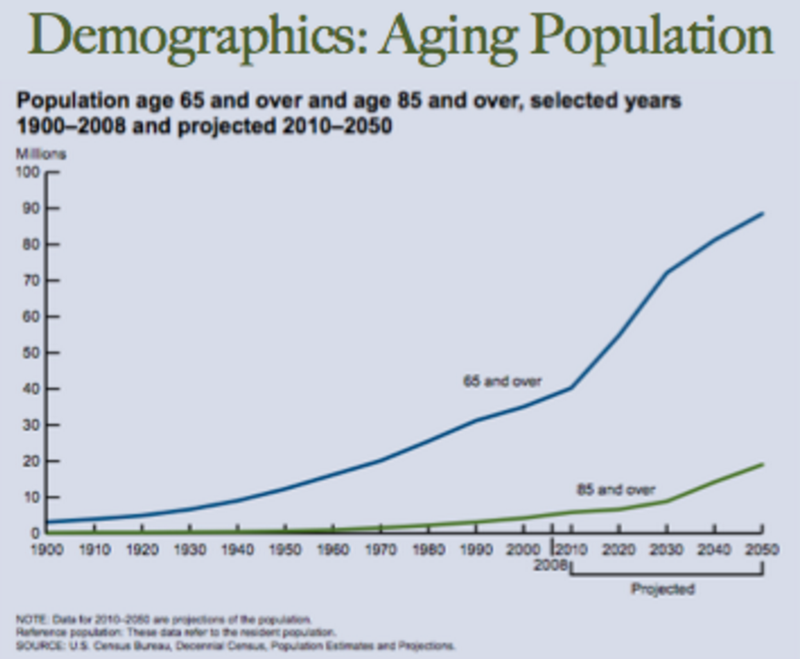 Global demographic aging is no joke. The world is rapidly getting old and sick as we have fewer children and the elderly live longer (but not better or with more vitality). This crisis is also known as the Silver Tsunami, and the most economically, socially, and emotionally catastrophic component of this trend is what I call the “Senile Tsunami” — the rising tide of neurodegenerative disease, particularly Alzheimer’s dementia. Source: Alzheimer’s Disease International, World Alzheimer Report 2010, accessed on July 11, 2012. According to the World Health Organization, the number of people suffering with dementia will triple by 2050. We have 35 million afflicted today and it will reach 115 million only three decades from now. That number ties Mexico as the 10th largest country in the world. And each one of those patients will require an additional caregiver to look after them. This is an enormous economic shock to an already troubled global workforce. The Senile Tsunami is a bigger problem than global climate change, which has politicians and the public running around hysterically. Indeed, it is a problem — especially for agriculture and rainfall patterns. But at least we have a clear roadmap to solving the problem: dramatically cut greenhouse gas emission, plant trees and grow algae to sequester CO2, and transition rapidly to a fossil-fuel free global economy. Of course the fossil fuel (“energy”) industry is one of the largest and most powerful lobby groups in the world, so there has been considerable resistance to pursuing this plan. Alas, we have a critical path and it is technologically feasible today with renewable energy, carbon capping regulations, and sequestration. And even if we don’t act, climate change will be a major economic disruption (lost beachfront property, destruction of property by natural disasters, lost revenue from agriculture, etc.) but we can adapt. We cannot adapt to our mortality and increasing decrepitude, nor that we have more people extracting money from the public purse for increasingly expensive medical care and fewer working-age people paying into the system (“dependency ratio”). One option, like the Japanese do, is voluntary suicide by the elderly (to reduce the financial burden on their family should they become ill). This is related to hospice and assisted suicide. That’s not a great option, but often the best option an individual has. But it’s not likely to work for the entire population. Plus, I want to live a long life and you probably do too. You may think that in 50 or 60 years you’ll be ready to go. But I bet if I asked you, as an 80 year old in decent health: are you ready to die tomorrow? You would respond with a resolute “No.” You still have family, friends, and goals. So longevity itself is desirable (even if a Black Hole instantly wiping out humanity in an could be a desirable utilitarian outcome if you ask Schopenhauer). The other option is to extend healthy lifespan, and even rejuvenate the aged. This has been demonstrated in animals many times already. Caloric restriction, geroprotective nutraceuticals, gene editing, and more recently the ablation of senescent (damaged, old) cells can rejuvenate aged mice by 27%. We are pursuing the elixir of life, the goal of Gilgamesh, the Philosopher’s Stone, and all the rest. I don’t believe biological immortality is achievable — but the goal of all medicine has been to prolong healthy life. So let’s get serious about it and stop consigning the elderly to 20 years of chronic degenerative disease at the end of life. This is a form of torture, and it’s avoidable today. Let’s get serious about aging. We need a Manhattan Project for aging — a coordinated effort with clear milestones motivated by an understanding that this global biological force is a greater threat than any foreign enemy. We need an engineering approach, and a lot more funding. The rate of progress is not intrinsic to the arrow of time — it’s directly proportional to societal investment and the talent of those working on the problem. “It seems reasonable to suppose that the discovery of a technique that can, in a laboratory animal, diminish to near zero the incidence of neoplasia, cardiovascular illnesses, and diabetic changes would prompt a substantial public commitment to working out the mechanism of the intervention and developing analogues that work well in humans. –Extending Life: Scientific Prospects and Political Obstacles by Richard Miller (2002).